Doesn't look like it might have a hard time keeping up with a 65cc two-stroke. What gives? Reviews of Yamaha's highly-regarded WR450F are easy to find.This particular article is a quantitative assessment of power gains at incremental stages of engine modifications commonly performed on the big WR. These stages include completely stock "out-of-the-box" (phase 1), "free" mods and AIS removal (Air Induction System - phase 2), the addition of an aftermarket full exhaust system (phase 3) and carburetor fine-tuning (phase 4). 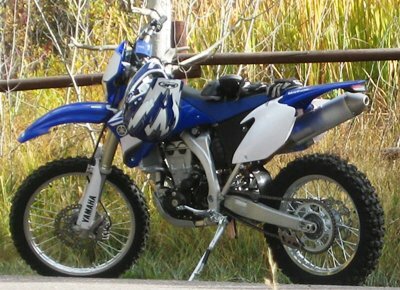 The 2008 WR450F project bike was purchased new by me in late 2010 off a showroom floor. Unfortunately my first impression of the big WR was one of a severely restricted bike. All of the full power of the large bore, high-revving, liquid-cooled motor was far from accessible. Why, one might ask, does Yamaha do this? We may never know the full explanation (though we can guess that green sticker qualifications certainly play a role). This factory setup is simply appalling for most and is suspected to be part of some master conspiracy which enables Yamaha to claim that their engine heads/valves last much longer than those of leading competitors. Don't get me wrong, I'm a satisfied, blue-blooded Yamaha owner, but I have to call it as I see it. Before getting to the performance test results, I should say a little about the test setup. The dyno runs were performed at Pocatello PowerSports by owner Chris Hymas. All runs were done using the stock knobbed tire. Since the dyno extrapolates power values based on torque measurements coming from the rear wheel, using a knobbed tire decreases the measured torque and thus horsepower by 2 to 5%. Since the same tire was used for all the measurements the relative changes between the different runs are still completely meaningful. At this point I'm compelled to give a shout to the staff at Pocatello PowerSports. Anyone interested in harnessing the full potential of their machine should visit PPS. They offer a full service shop with state-of-the-art dyno and engine tuning capability including, most importantly, a friendly, highly qualified and experienced staff who can fulfill the every need of your on or off-road bike from engine mods to suspension tuning and everything in between. This man is happy only because he hasn't yet seen the dyno chart for the bike that he confidently and proudly rode way out into the middle of nowhere. Sometimes it's what you know, rather than what you don't know, that hurts... So just how corked is the out-of-the-box 2008 WR? Well you may be quite surprised by the dyno results. Dyno runs (honest ones, anyway) are rarely supplied by OEMs. In the case of the WR I'm sure this is out of pure shame and utter embarrassment. I have just two words for you: Nineteen horsepower. That's right, don't rub your eyes - the bone stock WR450F profiled here produced a walloping 19.2 maximum horsepower during the initial dyno runs. Worse yet, this was the maximum number produced among several attempts - and Chris didn't hold back anything as he pushed the bike to its limit with each run. Needless to say, this result was even poorer than expected. After the realization had set-in that my 450cc WR only produced a little more power than a souped-up KTM 65cc 2-stroke, I nearly slipped into a depression (editor's note: members of the local riding community, employees of PPS and University colleagues set up an around-the-clock watch on Dustin just to make sure that a combination of anguish and access to race gas didn't get the best of him during this delicate time). I began to go through stages of denial and isolation, hopelessness and loss of confidence, anxiety and anger,... I needed to take care of this ASAP to preserve my dignity. This brings us to phase 2. But first, for the Yamaha loyalists out there who may feel that they cannot read any more of this, I want to say that this, thankfully, is a story of overcoming hopelessness and regret with a happy ending...so read on. Phase 2 of project "gimme my horsepower" included the first and most important steps in uncorking the vast capability of the WR. This phase includes the so-called "free" (or relatively cheap) mods. These include (in order of importance): replacing the insanely long WR throttle stop with the shorter YZ screw, removing the "grey-wire" (not cutting it) from the CDI unit, carb rejetting and fuel mixture adjustment, removing the airbox snorkel, removing the exhaust restrictor from the exhaust tip and removing the Air Induction System (AIS). Note that all these mods are fully and easily reversible except the removal of the exhaust restrictor. To perform these mods, a GYTR AIS removal kit was purchased ($50). Strictly speaking, this kit was not necessary to do these modifications, but it was helpful - especially for the AIS removal. The kit also came with detailed instructions for performing the various "free" mods, which was nice. By far the most crucial modification that every WR owner should perform is shortening the longer than necessary throttle stop - which I would argue is the single feature most responsible for concealing the available power of the engine by restricting flow capabilities at higher RPM's (by contrast, removing the AIS yielded next to no gain in power). Installing the YZ throttle stop gives the rider access to the full range of throttle motion and a lot more giddy up and go. This mod should be done at the same time the grey wire is removed. Removing the grey wire allows the WR to access the YZ's ignition timing advance curves which include high RPM capability. Once the air snorkel, exhaust restrictor and AIS were removed, the carb jetting and fuel-air mixture were given a quick/rough adjustment. Note that I had this work done at the Yamaha dealer where I purchased the bike, because at the time of the purchase I haggled a couple hours of "free" shop time. However, any competent person with the right tools and service manual could easily do these modifications (with, perhaps, the exception of the carb tuning - which is a big pain for WR's due to the carburetor's lack of accessibility). The phase 2 dyno results are shown as the red curves. As can be seen, the max power following the "free" mods was nearly 40hp - representing a 100% increase as compared with the out-of-the-box results. In other words, these were two completely different bikes and they certainly felt like it. At this point I think most riders might be content with a 40hp 450cc machine, but there was still a fairly big problem with the bike, that is, its hesitant low-end throttle response and high speed, mid RPM stutter - presumably the result of non-optimal jetting and overly rich mixture resulting from the ballpark carb tuning. This is where the power of PPS's dyno comes to bear. Through successive carb work followed by dyno runs, Chris Hymas can smooth out the low, mid, and high-end power curves providing a crisp throttle response throughout the entire RPM range. But before performing this final step, a new exhaust system was installed (phase 3). I chose a Dubach Racing Development (DRD) SS/Al complete system (model 7020 - msrp $579.95) which gave a good balance between performance and cost (editor's note: it even comes with a faux carbon-fiber endcap). Following the DRD install the dyno results (shown as green curves) showed an improvement to a maximum of nearly 43hp - which amounts to a significant 7 to 8% increase compared with the phase 2 results. The DRD header warms to a darned pretty color - but it's hard on boots and pants without a pipe guard (we are still looking for one that fits this system). Moose Racing pipe guard is to prevent dings only. Post-modification. Eats speed, poops carbon fiber. Maximum horsepower came, however, at the expense of a slightly lean mixture and inconsistent low-end performance. So it was time for PPS to perform more magic (phase 4). Anyone can perform the "free" mods and install an exhaust system, but not everyone has the knowhow and equipment to quantitatively fine-tune a carburetor's setup. Following the phase 4 carb tuning, the peak horsepower actually decreased to 41.5hp (which is still 4.5% higher than the phase 2 results) but the power and torque (black) curves were smoothed out over the entire RPM range - and a slightly rich bike is a happy bike. The results were a peppy, crisp throttle response that could make a grown man giggle like a kid in a candy store. end of the pipe sticks out quite a bit more than the stock pipe making it vulnerable to getting dinged by rocks. This was one of the reasons I went with the stainless steel version. I still purchased a one-size-fits-all Moose Racing pipe guard to protect the exposed front of the header. One final detail worth mentioning pertains to the desert tanks available for the WR. I chose an Acerbis tank because of their reputation for quality in construction and design at the right price. Unfortunately Acerbis only makes a 6.6 or 3.3 gallon tank for the WR - which was either way too big or not quite big enough. I couldn't deal with the huge 6.6 gallon so I went with the 3.3 version which I found could actually hold 3.5 gallons of fuel. I am very pleased with the tank as it's held up great over the past 1000 miles. It takes a beating, protects my radiators, and does not really stick out any more than the stock shrouds. Ideally, a 4 to 4.5 gallon tank would be perfect but the only tank in this size range was made by Aqualine and was twice the cost of the Acerbis. To cope with the smaller tank size on long trips I use a JAX collapsible one gallon fuel bladder strapped over the tank or around the headlight. Dealing with the bladder can be a pain but it beats carrying a gallon of fuel on my person (and it's emptied after the first 35 or so miles anyway). Many thanks to our friends at Pocatello Power Sports for crafting our latest ultimate adventure motorcycle. PPS is one of the best motorcycle shops imaginable. We use PPS exclusively for MoJazz project and race bikes They can hook you up with the bike of your dreams too.